The Old Patagonia Express. 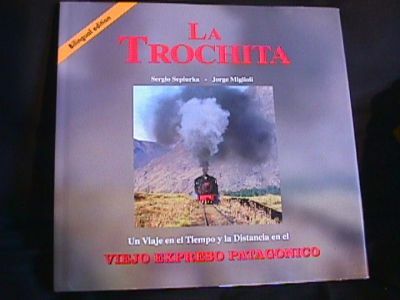 "La Trochita",in the south of Argentina. The Old Patagonia Express. "La Trochita",in the south of Argentina. Book by Sergio Sepiurka and Jorge Migliolo,only book on the Trochita that I have found, and with great details and wonderfull photos.A great addition to your train book collection. Video Clips on Buenos Aires and Argentina, Press Here. So if you are interested in Art, Design or Antiques, and you are travelling to Buenos Aires, Argentina, or to Santiago, Chile or even Montevideo, Uruguay and need to buy and export these items or only need tips and travel information, please feel free to email us…….Please feel free to contact Bob Frassinetti with thsi email address: Email: Bob Frassinetti. Art and Music for Buenos Aires, Argentina.